Cirencester was the subject of a report in An Account of Several Workhouses..., dated December 30th, 1724. The Vestry of this Parish, in pursuance of the Powers granted by a late Act of Parliament on the 15th of October last, made a Contract with a substantial Inhabitant of the Town to take Care of the Poor upon himself at Lady-Day next for three Years to come, and to allow him fifty Pounds a Year, and a Deputy or two with not above 10l. a Year Salary for each. He is by this Contract impower'd to borrow 200l. upon Interest, with which he is to fit up Chesterton-House, (being an old Substantial, large House adjoyning to the Town, not in it) with a little Barn thereto belonging, and Part of the Court or Backside for a Workhouse, being given to the Parish by a Person of Quality for this Purpose : And when fitted up, this Undertaker is to receive all the Poor, who receive Collection of the Parish into it ; He is to be their Master, and is to provide all the necessary Tools and Utensils for employing them, in the Woollen and Yarn Manufacture, being the proper Business of this Town, and to Sell the Work when done ; He is to Buy in all necessary Provisions and Household Goods for the House, and Apparel for the Poor in it. This has so fully answered the Expectation of the Parish-Officers, that it is with good Reason they have resolved to continue it ; for tho' the Workhouse has not subsisted quite 5 Years, it is computed that they have saved about 140l. per Annum, in their Taxes for the Relief of the Poor, and have paid a debt of 200l. borrowed upon Interest, towards repairing and furnishing the House, at the first setting of it up ; and all this, notwithstanding a Run of the Small-Pox through the Town in 1725, and an epidemical Disease in the Years 1727 and 1728, when many private Families were necessitated to be relieved out of the publick Fund in those calamitous Years, and that the family in the Workhouse hath gradually increased from 30 to upwards of 100. It must also be remembered, that Provisions of all Sorts for 2 or 3 Years past, have been at an uncommon high Rate, tho' now, God be praised, they are sunk to a more moderate Price, as well as a better State of Health restored to the Town. A parliamentary report of 1777 recorded a parish workhouse in operation at Cirencester for up to 120 inmates. Fairford had a parish workhouse on The Crofts, later the site of the cottage hospital. Gloucestershire: Ampney Crucis, Ampney St Mary, Ampney St Peter, Badgington (Bagendon), Barnsley, Baunton, Brimpsfield, North Cerney, South Cerney, Cirencester (4), Coates, Colesbourne, Daglingworth, Down Ampney, Driffield, Duntisbourne (Dunsbourne) Abbots, Duntisbourne (Dunsboure) Lyre, Edgeworth, Elkstone, Fairford (2), Harnhill, Heatherop, Kempsford and Welsford, Maisey Hampton, Preston, Quennington, Rendcomb, Redmarton, Sapperton, Siddington, Stratton, Syde, Winston. Wiltshire: Kemble, Marston Maisey, Poole Keynes, Poulton, Shorncote, Somerford Keynes. The population falling within the union at the 1831 census had been 18,720 with parishes ranging in size from Shorncote (population 29) to Cirencester itself (5,420). The average annual poor-rate expenditure for the period 1833-35 had been £10,777 or 11s.6d. per head. The new Board of Guardians had their first meeting on 22nd January, 1836, and formed a committee to organise the planning and construction of a workhouse for 250 inmates. The following month the Building Committee had found identified a suitable plot of land to the south of the town, to be purchased from Lord Bathurst. The Committee advertised for plans and in March accepted a tender from John Plowman of Oxford. Building commenced that summer and the workhouse was completed the following year. The Poor Law Commission authorized the expenditure of £4,309 on the new workhouse, with a slightly increased capacity of 300 inmates. The site location and layout are shown on the 1902 map below. Plowman's design was a variation popular cruciform plan, with a long entrance block facing to the south-west. Cirencester entrance block from the south, 2000. To the rear, four accommodation wings for the different classes of inmate (male/female, infirm/able-bodied etc.) radiated from a central supervisory hub. The octagonal hub had windows which allowed workhouse staff to observe all of the exercise yards which lay between the wings. Cirencester rear of entrance block (left) from the south-east, 2000. Cirencester accommodation wing from the south-east, 2000. To the rear, a further parallel block probably contained the workhouse infirmary. 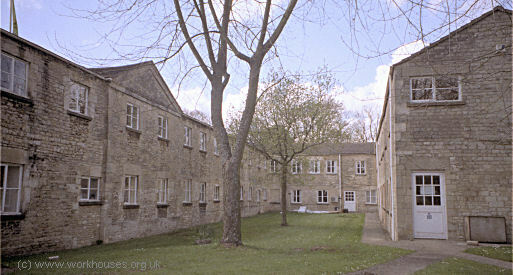 Cirencester rear block from the south-east, 2000. 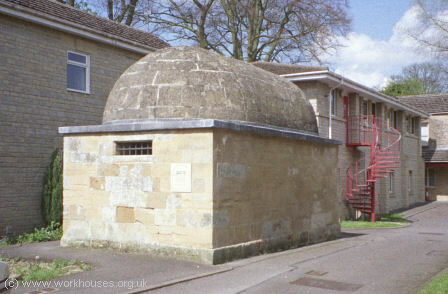 One other addition to the site was the Cirencester lock-up. This 18th century building originally stood in the town in Gloucester Street but was moved to the workhouse site in 1837 and placed at the north-east of the main building. Most of the workhouse buildings (including the lock-up) survive in the form of local district council offices. Gloucestershire Archives, Clarence Row, Alvin Street, Gloucester GL1 3DW. Holdings include Guardians' minutes (1836-1935). Cirencester Bingham Library, The Waterloo, Cirencester, Gloucestershire GL7 2PZ. Holdings include: Printed pauper lists (1878, 1880-1912). Copies of workhouse plan, 1837.